Want to spend St Patricks Day in Dublin? 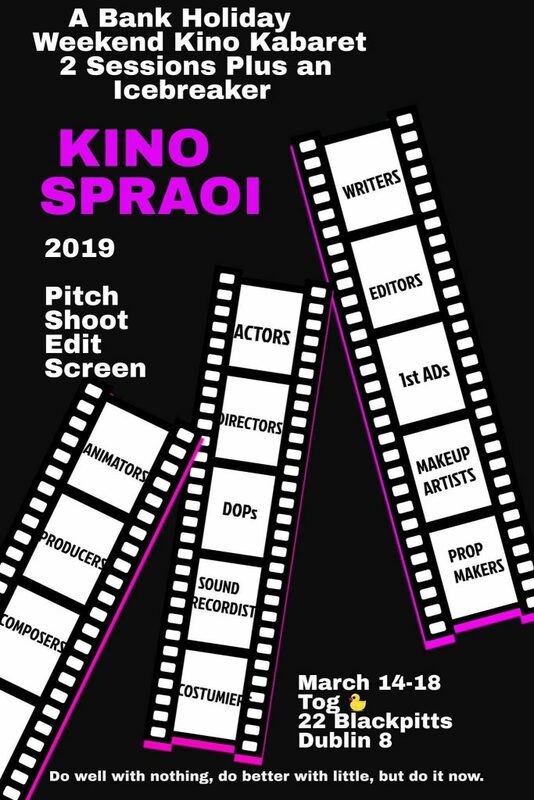 Then come along to Kino Spraoi (Irish for fun) and make some films while you are here. If you have and interest in film-making or are a writer, director, actor, producer, DOP, sound recordist, animator, editor, makeup artist, SFX artist, composer, prop maker, costumier, 1st AD or would just like to get involved then this is the event for you. Over the five days (Thursday 14th till Monday 18th) there will be two sessions plus an Icebreaker session and you will have the opportunity to join a team or pitch your film, shoot it, edit it and screen it. The cost of a ticket for the 5 days is €45 or €25 per session if you just want to do one. Places are limited and you must register to attend. Registrations open. This was written by Jules. Posted on Thursday, February 7, 2019, at 11:31 pm. Filed under Uncategorized. Bookmark the permalink. Follow comments here with the RSS feed. Post a comment or leave a trackback. ‹ Design Challenge in Tog – we want to Jam it with you!